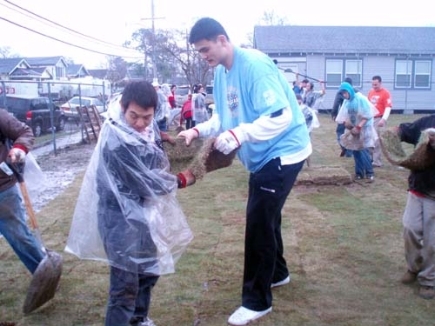 Below is one of my favorite pictures of Yao from Friday’s All-Star events in New Orleans. Not him being interviewed by the press (although he had to do that earlier in the day) which we have seen time and time again. Not reading a children’s book with just as many photographers as kids around. No, it’s of Yao outside in cold rainy weather getting his hands dirty lifting and planting sod with actor Jet Li. It’s so representative of Yao’s hard work ethic to take on this assignment. Bravo, Yao. Click here for more photos of Yao with Jet Li volunteering. Scroll up on the following page to see Yao and other NBA players getting interviewed. Thanks go to Raymond for the pics! This entry was posted on Friday, February 15th, 2008 at 9:32 pm	and is filed under Charity work, NBA All-Star game. You can follow any responses to this entry through the RSS 2.0 feed.